You are currently browsing the tag archive for the ‘online gaming’ tag. I have been really looking forward to writing this review, as not only do I get to talk about this book – I can direct you to where you can find the book in PDF form (Here). The author’s website has further information on his research. I should mention I was originally directed to Lastowka by io9’s article published this week. That felt good. I like to share. 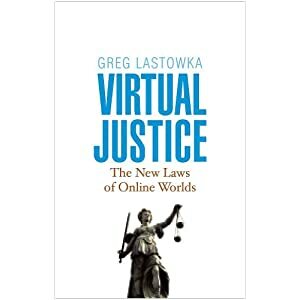 Greg Lastowka opens his book on the legal ramifications of online conduct by comparing three castles, representing three states of law. Firstly he introduces the era of the physical castle itself, a fortified site of power for regants and later gentrified land-owners. Property law today still descends from the relationship of those who lived on the land of these castle inhabitants, with ‘landlord’, and ‘tenants’, the tell-tale references to the past. Then we have Disney’s Cinderella Castle, that fantastical gateway to the Magical Kingdom(TM) that actually enjoys surprising autonomy in its zoning laws, courtesy of clever negotiation on the part of Disney with Florida state officials. Finally we have the castle of Lord Britain. You may not of heard of him. He exists in the game series Ultima, has occasionally served as an alter-ego for developer Richard Garriott. Lastowka relays two interesting anecdotes in regards to Ultima. The first describes how ‘virtual property’, such as a castle that can be owned within the game by a player, has become so desirable that it holds actual financial value. This is something that is common to many game series. In fact developers now market downloadable content for games such as Oblivion to players for a nominal fee. Lastowka asks, if virtual property has value, then shouldn’t the laws regarding ‘real property’, also apply? The second Ultima tale also presents something of a riddle. In what almost sounds like the beginnings of a fairy tale, it appears Garriott as Lord Britain witnessed a player being robbed by another player. He intervened and using his in-game abilities, defeated the thief. Then moments later the ‘criminal’, repeated the same act. Garriott this time banned the player from Ultima, only to be confronted with the argument that if the game did not explicitly ban such behaviour, theft in this instance, the player should not therefore be punished so disproportionately. Lastowka discusses how other online and virtual platforms such as Second Life, World of Warcraft, even Facebook’s Farmville (and I would include social networking sites like Facebook, Twitter, Myspace and the like also) have continually frustrated legal precedence, as the laws relating to theft, assault, libel are bound to geographical jurisdictions. Where is the jurisdiction when the perpetrator and the victim are separated by thousands of miles, with the servers where the event, in situ, happened in an entirely different location again? Even online behaviour is held to a different standard from the Real World. Are husbands and wives who indulge in in-game relationships with virtual avatars guilty of adultery? Can an emotional attachment to a stranger wearing a digital body be considered real? We have the tragic case of Qiu Chengwei, who committed murder after his virtual sword was stolen and the police refused to get involved. As much as the ‘Dragon Saber’, sword may not have seemed important to the police, in Qui Chengwei’s eyes it was something worth killing for. How does the law regulate such acts if some see the matter relating to fantasy and others a profoundly personal reality? John Perry Barlow’s A Declaration of the Independence of Cyberspace articulates the feeling of many online pioneers, that the internet is a virtual state and not beholden to the legalities of the physical world. This is a notion that often crops up in discussions of online censorship. However, such appeals to freedom and group self-policing do not account for the need for legal protection and prosecution of cybercrime. This conflict between the idealised anarchist online state and legal precedent continues today. As a causal online gamer, I found this to be a very interesting book. It eschews legalese and is quite well argued. Recommended.